Tōkyō : Hayakawa Publishing, Inc., 1975. This is Hillerman's first Japanese edition and the only Japanese edition of Dance Hall of the Dead. 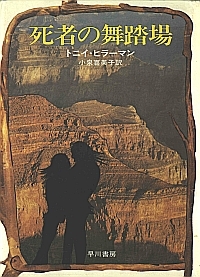 The dust jacket has a full color photograph of the Grand Canyon, with an abstract silhouette of a windblown couple embracing. The back cover of the jacket is a black and white photograph of young Hillerman smoking a pipe in front of a book shelf. A removable paper ribbon wrapped around the dust jacket announces that Dance Hall of the Dead was awarded the Edgar Award for Best Mystery Novel in 1974. Binding: Red cloth covered boards, black imprint on spine and back cover, full color dust jacket with additional paper ribbon announcing the novel's award of the Edgar Award for best mystery novel.